As a child I’d heard of the bushman though the story telling of Laurens van der Post, his books and films. Many years later, my intrigue in their culture and hunter-gatherer way of life still yearned to experience how they lived. How does an egalitarian culture that has existed for thousands of years manage alongside the modern-westernised world of the 21st century? What wisdom do they have to offer us, should we ask? And, what skills can we learn from the bushman? Just some of my questions I felt needed answers. To gain some perspective – Namibia is vast, more than six times the size of England with a population of just 2.5 million! The Bushman, the indigenous people of Southern Africa, have lived there for tens of thousands of years. There is possibly just 100,000 Bushman remaining, living mostly in Botswana, and Namibia, with some communities in South Africa and Angola (Survival International). 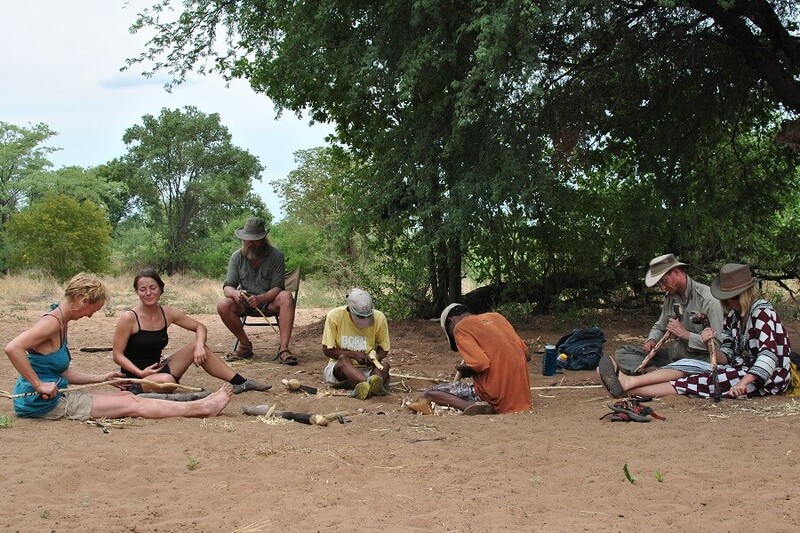 I joined a group of similarly interested people, to spend time living in the bush for a month, learning from the Ju/’Hoansi-San, the Bushman near TsumKwe in the North East of Namibia. It was a two-day drive from the capital Windhoek. The main roads north to Grootfontein, our first stop over, were paved with tarmac. But, from then on, the roads were sandy and often rutted, and with more game wandering around, it was a challenging but non-the-less interesting and rewarding drive. We arrived in late Spring, it was pretty warm, and as summer approached it got hotter, above 30°C and over 40°C at times. Our first task was getting used to the environment, taking precautions to avoid unexpected encounters with snakes, bugs and predators and of course setting up our camp! After the rocky outcrops and hills of the South, it would have been easy to get lost in a largely featureless terrain, with endless prickly bushes and few if any obvious tracks. Our main navigation point was the main road – the sandy and rutted road we arrive on! It was always good to remember that we were not at the top of the food chain here in the bush. Roy’s (an experienced wilderness guide in our group) advice was to “be relaxed, but attentive” – this mantra ensured you enjoyed being in the bush whilst taking the appropriate amount of care for yourself and the group as a whole. Thanks Roy! Life each day at Elephant Song Camp, often started with a wonderful sunrise, the sounds of the franklin’s calling, the call of the go-away-bird, and other birds singing too. First job was reigniting the fire, usually blowing the embers back into life, adding a few dry sticks, filling the kettle with water and putting it over fire. Then it was time for some Pilates / Yoga, to warm and stretch my body ready for the day. Our days were mostly filled with crafts, tracking and wildlife watching, and come the end of the day, we were treated to beautiful sunsets and an amazing light as the dusk descended, encouraging us to finish our task before darkness would be upon us. The terrain was brilliant for tracking, the sandy substrate displayed the tracks of mammals, reptiles, birds and insects beautifully. That’s not to say we were always sure, well at first, what we were looking at. 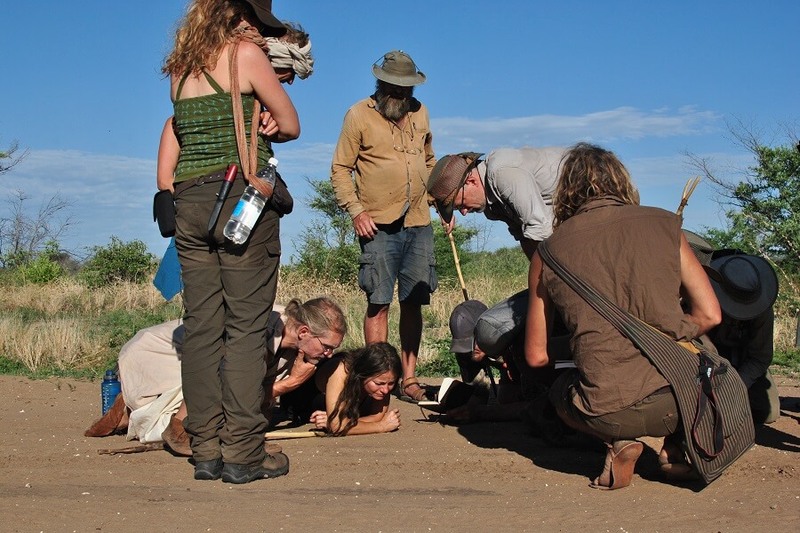 Within our group there were knowledgeable trackers from Northern Europe, others with experience from South Africa and America, and novices too. Through careful examination, considering the print patterns and all associated clues and with guidance from the Bushman, we learnt more and more every day. So, we all gained and learnt to recognise the tracks and signs left out on the trails. One very special moment for me was when one of our Bushman guides asked me to identify a track. The ground was hard packed sand, with lots of long dried grass all around. Looking closely, I simply couldn’t see the track he was asking me about, I eventually had to ask him to show me. There was a grin, and he used a stick to show me the outline of the track – it was huge, about 16-inches (400mm) across, yes, it was the spoor of an elephant! We had spent so much time looking at smaller tracks, you had to step back and see the bigger picture. Taking another close look, I learnt how to identify the toes and then, looking ahead, I could now see the direction of travel, and the deep footprints left during the last rains, about a year ago, with the long-dried grass bent over. With tracking, as is true for many things, you need to get your eye in and once you do, things become far clearer – a wonderful moment, thank you Comsa! Sometimes you arrive in a place where you feel a special connection. Maybe you haven’t found a place like this yet, but they are out there, that’s for sure. This was such a place, a short distance from our camp, we drove down a sandy track, and there she stood. It’s difficult to gauge the scale, but the limbs of this wonderful baobab tree were huge. I walked 75 paces around this amazing tree, just taking in the enormity of it all and wondering how old this tree must be and the stories it could tell of people from the past. It’s thought to be more than 1000 years old. There was evidence of elephants all around, the tracks like fossils in the hard ground, piles of dry dung and deep scars on the bark, carved by the elephant’s tusks, leaving their marks for future generations. How do you understand the people of a village that you know so little about? One of the ways was through learning practical skills. The learning style of the Bushman is one of observation, you would watch how something is done for as long as is necessary and then repeat the process yourself. This is typically how the children would learn. A boy would accompany a his father or grandfather on a hunt, observing how they identified tracks and trailed an animal. Similarly, girls may walk with a matriarch or their sisters and be guided through the bush, helping to gather the berries, learning which ones should be collected and which should not. We watched how dry, salted impala skins were scraped clean using a chop-chop, a versatile axe-like tool. First the hair was removed using short-scraping movements, taking care not to penetrate the hide. Once complete, it’s a long job, the hide was turned over and the membrane was scraped away along with the salty residue. As we got to work on the impala skins, this activity quickly became a social event, not only were men and women from the village joining in, but many of the children wanted to have a go too. At one stage, there were eight young boys, taking turns to scrape the hide I was working. Similarly, young girls were working with the ladies in our group. 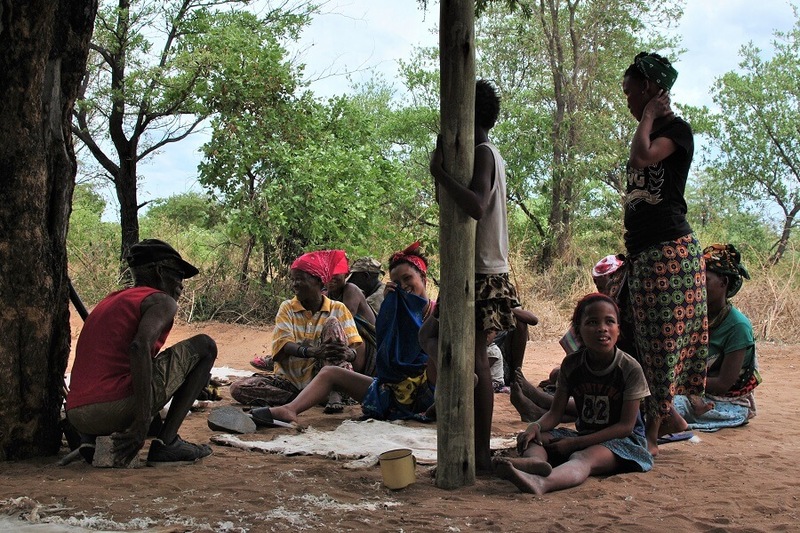 Later the elders told us that many in the village had not worked hides before and that we had sparked their interest through our participation in the hide preparation. When you don’t have much, you need to be inventive! The Bushman make tools from scrap metal combined with wood from the local trees, and hides, sinews and bones from the animals they hunt. More time being attentive – we watched as they heated old metal bolts and shaped them into useful tools. These included the blades for chop-chops (an axe-like chopping / cutting tool), spear tips and knife blades. The bolts were heated on the open fire, retrieved from and held with pliers and hammered with heavy club-hammers to flatten and shape the bolts into new tools. It was fascinating to watch the skill of the Bushman, to see a knife being made throughout the day. A bolt being repeatedly heated, hammered and shaped to create an long oval blade with a rat-tail tang. Later, a single piece of hardwood was cut to create a seamless handle and sheath, the timber shaped using a large chop-chop. The blade was burnt into the handle – initially, a small ‘branding-iron’ was used to burn a hole and then the tang of the blade heated and burnt into the handle. Finally, it was time for some careful carving, slimming down the sheath and handle in unison to make a beautiful traditional Bushman knife. We headed out into the bush with our guides to gather the sticks we needed to make bows and arrows, spears, digging sticks, and handles for our chop-chops. Most needed to be relatively long and straight, but our chop-chop handles, needed a right-angle at its base, this was to receive the chop-chop blade. The method used to straighten the sticks and remove the bark was to char it in a fire – then bend it gently and repeat until straight. The bark would then easily peel off, and with the heat applied, this hardened the wood, making the components tougher and more resilient. I’ve always loved making things from wood, I find it a calming and relaxed occupation, so I looked forward to using these familiar skills. We watched the Bushman attentively, noting the methods they used to char, straighten, chop and carve these tools and weapons. It was then our turn. One of the first tools we made was a digging-stick, as the name implies, this was for foraging roots. Once straightened, we shaped the end used for digging so it was tapered with a blunted point. This was then hardened in the fire, ensuring it got hot, drying the wood to make it hard, but of course not burning it! Our spears followed a similar method, and would be mated with a metal spear tip, heated and burnt into the end of the wooden spear. For anyone who has ever used and / or made a flat-bow or long-bow (yes, think Robin Hood for those who haven’t), the Bushman bow is considerably lighter and smaller by comparison. The bow is less than a metre long with the limbs just 10mm in diameter at the centre of the bow and tapering towards each end. So, much care was required to ensure we didn’t end up with broken sticks! Arrows were also made, the shaft from a reed grass, now dry having grown in the previous wet season. The arrow tips were made from a piece of wire – the end of the wire was gently hammered to create a thin, blade-like tip that was then filed into shape. The end of the arrow shaft was reinforced with sinew and then the shaft of the arrow tip inserted. Needless to say, we did not apply any of the Bushman’s deadly poison to our arrows – the poison they use is lethal. It’s made from a beetle larvae, and should any of it get into your blood stream, even a very tiny cut, would mean death! Finally, it was time for some target practice, no not on live animals, but a straw target. Well I was pleased, my little bow and arrow performed well, it hit our straw target right in the middle, result! Northern Namibia is within the Tropic of Capricorn, so when it rains, it is a veritable deluge, swamping huge areas, creating raging torrents down rivers and filling all the pans (dried up lakes the remainder of the year). The rains had only just arrived as we were getting ready to leave, but we were treated to some pretty amazing storms and lightening shows. You quickly began to realise why there were so many blackened trees, most were the result of lightning strikes! Once the rains had started, everything took on a new vibrant greenness. Identifying the new tracks each day, we could see that animals that had been further north were now moving south. But for the majority of the year, the lands of Namibia are parched and very dry, with little opportunities to find open water sources. For the Bushman, finding other water sources is essential. One such source is the water-root. We were taken on a long walk, through prickly bushes, to look for the tiny vine-like shoot that grows up through those prickly bushes. Our digging sticks were put to good use, the root was half a metre down, the root was finally dug out, scraped and eaten – yes, it was tasty and thirst quenching too. Namibia – In a land with little water for most parts of the year – you need to know where to find water. 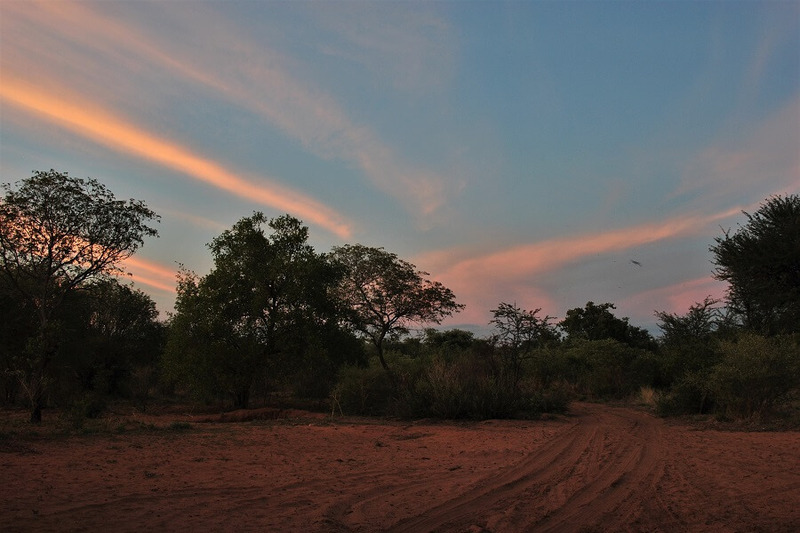 To be clear, the majority of water has long since been sourced from local boreholes – the Kalahari sits above a huge subterranean water reserve. Our camp had a stand-pipe near-by which was shared with the Bushman village. There was a solar-powered pump that raised the water up from the reserve – this generally worked fine when it was sunny, unless someone had disconnected it to charge their phones (life’s modern-day essentials right). Alas, when it was cloudy, the pump would cease to work, which meant no water was available! Interestingly, there were no obvious methods for capturing water when the rains came, and the pumps didn’t supply water – no guttering around buildings or huts. When the rains came, the Bushman would walk to the nearby pans, to gather their water. One of the Bushman’s favourite treats was the brandy-bush with its ripe raisin like berries. The berries, light brown in colour, tasted of raisins, with a small seed in the middle. The ladies and girls of the village gathered these in large quantities, eating a few as they went from bush-to-bush. 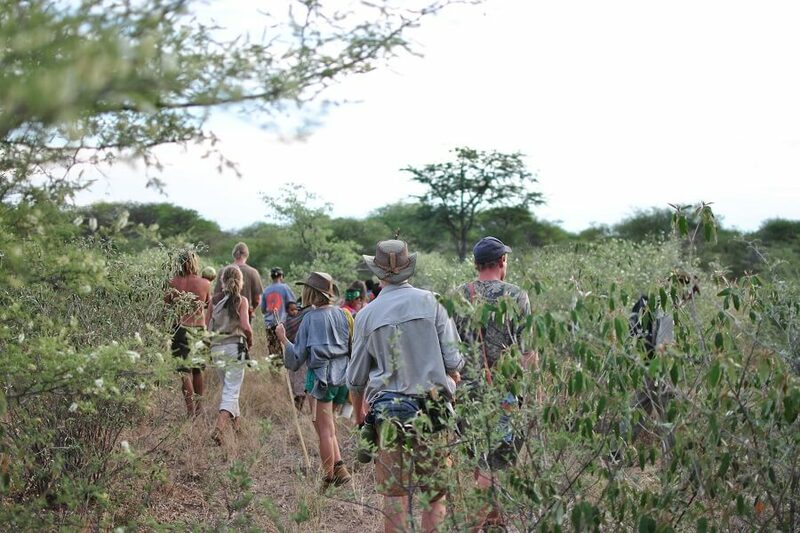 We enjoyed gathering them too and when out on our walks were always on the lookout for the brandy-bush. On other foraging forays, we looked for the leaves of mother-in-laws-tongue (yes, you may have seen this as a pot plant in your local garden centre). This time, what we were looking for was not for eating, but for using its fibres to make bow-strings or other strong cords. To process the leaves, the outer tough fibres were removed and discarded, and then the fibrous leaves scraped and drawn under the sharp end of a digging stick to remove the glutenous part of the leaf and reveal the white fibres. The resultant fibres were a little like those of flax, and when a few were twisted together, they made a very strong cord or string. Like any new skill being learnt, lots of practice was required to get anything approaching the quality and quantity of fibres achieved by the Bushman! The days were hot, I was regularly getting through five litres of water a day! So, the idea was to start our days early and have a siesta when it was at it hottest in the middle of the day – trouble was, having a siesta, a snooze, when it’s roasting hot was far from a relaxed affair. Often it just meant doing things at a more leisurely pace, preferably in the shade if you could find some. We really did have a siesta this time, well those of the group that didn’t go for a walk, exploring the pan. 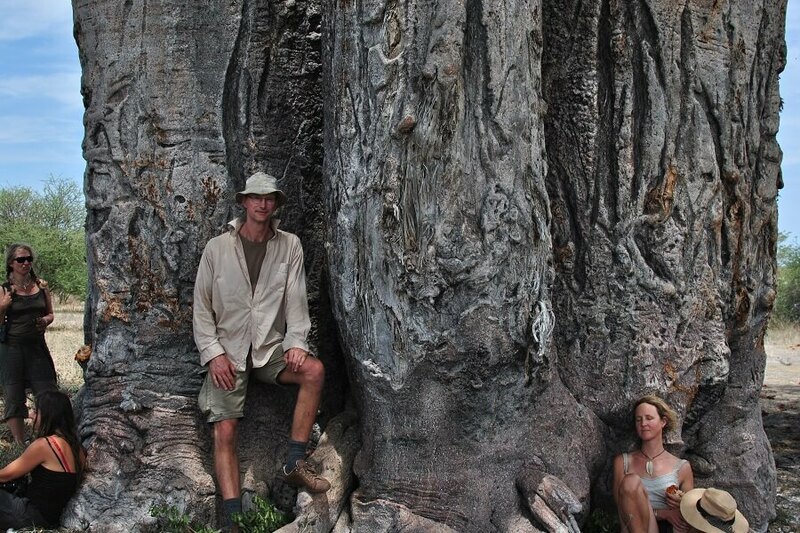 This lovely baobab tree provided us with some much-needed shade – so we had a lunchtime sleep. Whilst not quite as big as the other baobab we saw, it was 15m in circumference, Stephan, standing there in the middle of the picture, is a cool 2m tall, it was a big tree! The elephants obviously love this baobab, leaving their graffiti marks across the whole tree! Yes, those gauges in the bark are made by the tusks of the elephants, and they go a long way up the tree, bull elephants are big, very big. 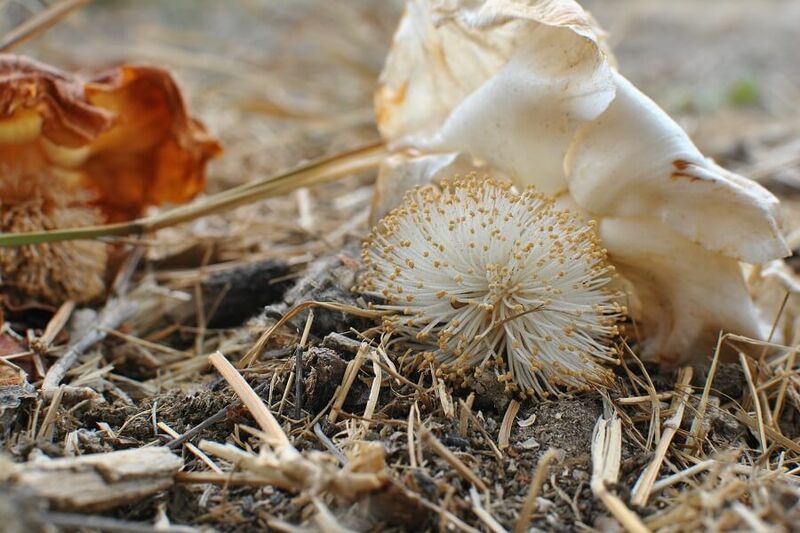 Whilst we sat around the base of the baobab tree the fragrant flowers fell upon us. The fresh flowers, a creamy off-white, were reminiscent of broccoli or cabbage smells, but as they decayed to orange-brown, they gave of a beautiful fragrance, one that you could imagine paying lots for in a department store! 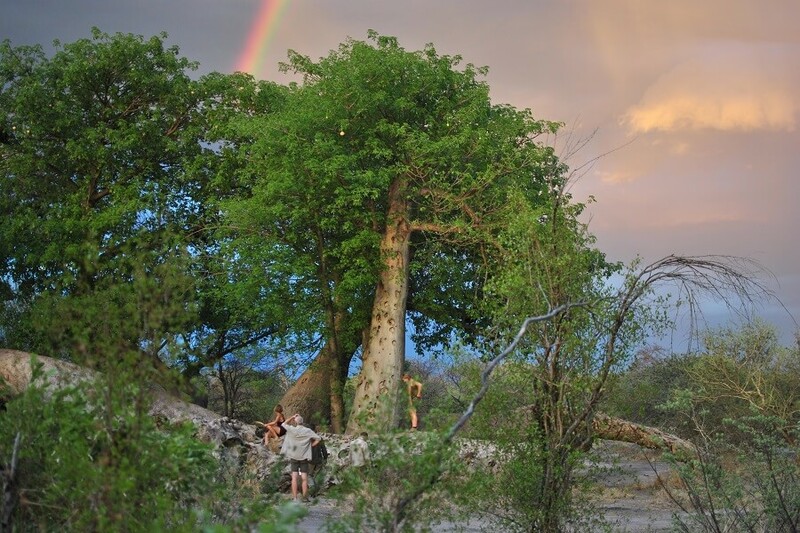 Namibia – Out on the edge of the pan, this baobab stood out from miles away – there was just the one! 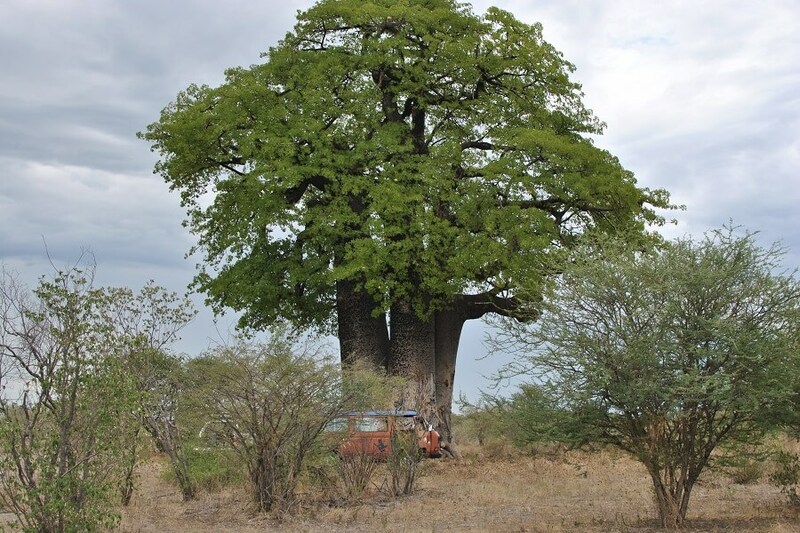 And to finally get a real sense of perspective, Werner’s VW minibus, looks quite small, being dwarfed by the colossal baobab tree. It was the only baobab in this area, but apparently travelling further north into the heart of the tropics, there are many more. The life of a hunter-gatherer may seem romantic, gathering berries, digging up tubers and hunting game, but the reality is tough. We were joined by two of the village elders to go hunting for spring hare. Not knowing what may happen, how the hares would be caught or even if we / they would be successful in the hunt, we headed out into the bush. The spring hare lives in burrows, as many of the Kalahari’s mammals do. So the first task was to find active burrows, ones with fresh tracks leading down the holes and of course fresh poo! Having found a possible burrow, a long pole with a hook on the end, was passed, pushed and pulled down the burrows – to hook a spring hare. 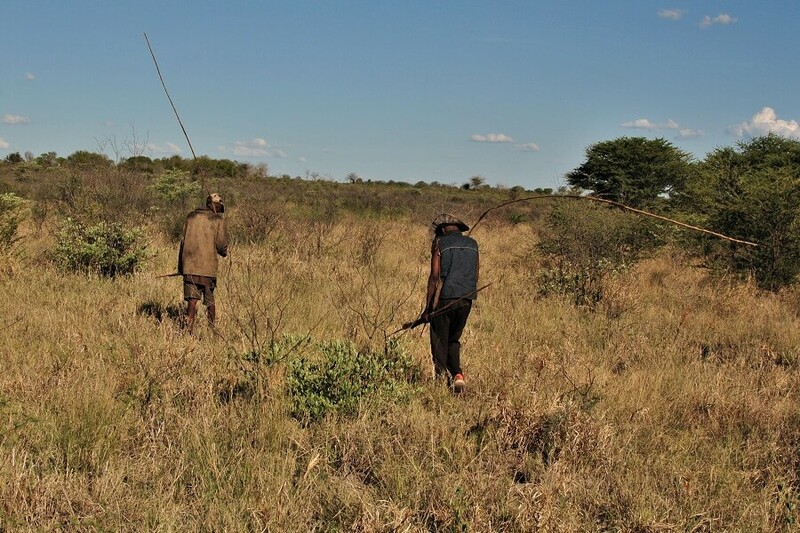 We walked around the pan with the Bushman for a few hours, with many burrows being checked and poles push and pulled. But despite best efforts to hook a spring hare – none were found. Apparently, the hares have been learning how to outsmart this hunting method, digging tunnels with right-angles in them, so that the poles cannot reach them – those spring hares are smart! 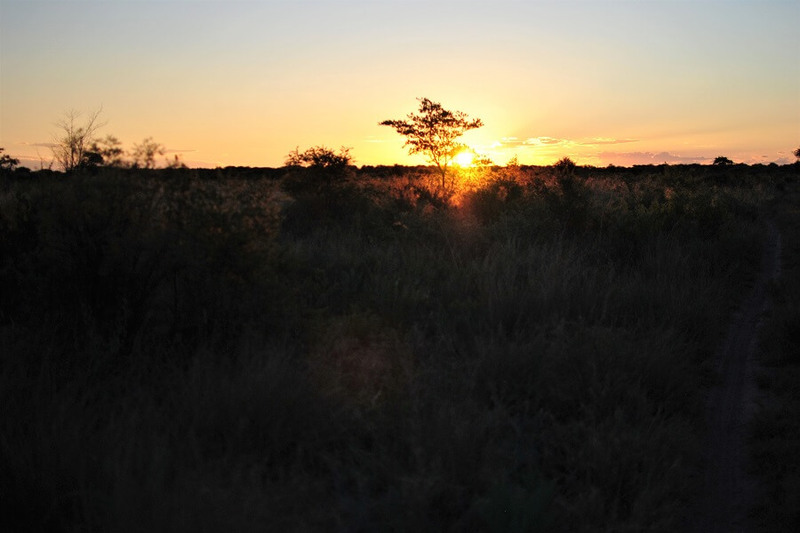 We spent a month here in the wilds of Namibia, enjoying the simplicity of life. Each day had a natural rhythm, the familiarity of fire and food, learning and sharing in the community, both within our group and with the village too. There was time to build relationships, get to know members of the community, laugh and joke, tell stories, and sing and dance around the campfire. 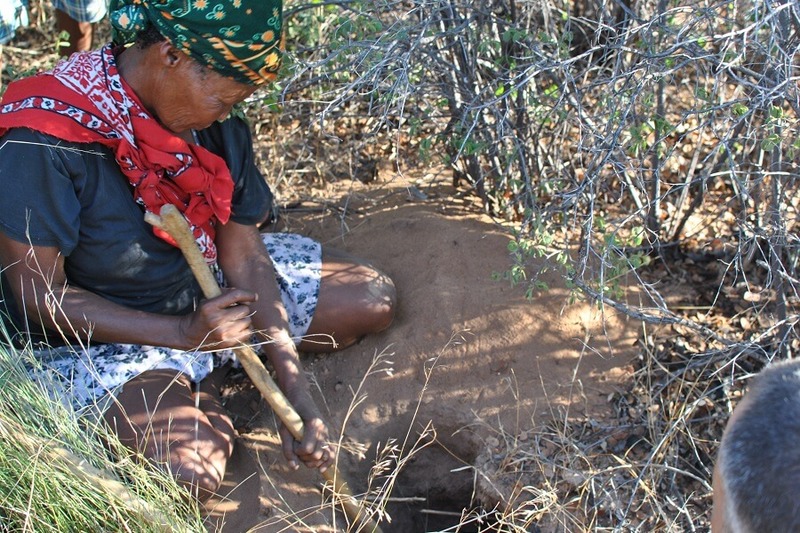 The Bushman are isolated, both socially and physically and yet are still strong and resilient. The pressures of the modern world are knocking at their door, and with the older children educated away from the village, there are influences that will certainly entice and draw some away from their community. I think their strength comes from their culture and what feels like an inbuilt contentment with life. They may have concerns for the welfare of their children and community as a whole, but these are not that apparent. Medical facilities are not near-by and our team helped a few times, remedying quite serious conditions and also providing transport to the clinic in Tsumkwe. What would they have done if we had not been there, it’s difficult to say. The village is not reliant on hunting and gathering anymore, they do both regularly, but depend more on supplies purchase from the general stores with income generated by the Living Museum, and the crafts and activities they provide for tourists. They were always welcoming and friendly and when I asked what they would like me to say to friends and family this is what they said, “please tell them to visit us and we will welcome them to our village”. So, should you decide to visit Namibia, please do spend time with the Bushman in one of the Living Museum Villages, you will be sure to have an enjoyable and fascinating experience. My memories are of a strong and caring society where men and women, whilst having different roles within the community (hunting vs. gathering for instance), appear to have lively discussions and an equal say in most things, especially the matriarchs! The children learn though watching the elders and are left to learn and play together, with older children looking after and guiding the younger ones. The experience of learning from the Bushman, living in the bush and enjoying such a beautiful country will stay with me always. But what i think was most poignant, is their apparent contentment with life. I say apparent, because I was a guest, a visitor, and it’s difficult to truly know if this is the case. But, this is the last impression I had of my time in the bush and if one can be content then life will good. With thanks to Casparo Brown who organised this trip, Werner Pfeifer for sharing his knowledgeable of tracking and the Bushman, and Lynx Vilden who brought her special “stone-age je ne sais quoi” to our adventure. 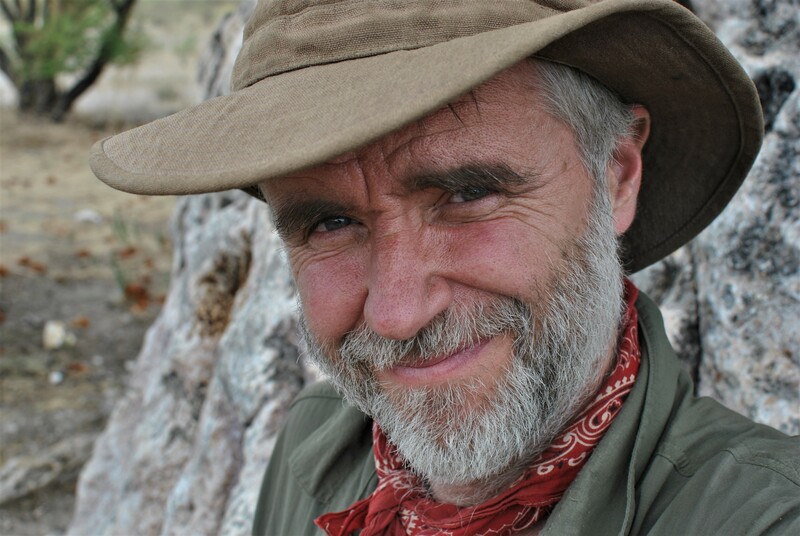 Thanks also to my fellow travellers and members of our group, and finally, a huge thanks to the Ju/’Hoansi-San, the wonderful men, women and children of the village at Elephant Song Camp, Namibia. Visit The Living Culture Foundation Namibia to find out more (www.lcfn.info) – thank you.